The camu camu (Myrciaria dubia HBK) belongs to the Myrtaceae family, is a wild bush fruit of the Amazon, which grows on flooded riverbanks and old dark water lagoons and can remain completely submerged in water for four or five months. In Latin America on the banks of the Amazon, Ucayali, Marañón, Napo, Tiger, Curaray, Yavari and Tahuayo in Peru; Putumayo and Inírida in Colombia; and in the upper basin of the Orinoco in Venezuela. The greatest concentration and diversity of populations are in the Peruvian Amazon. The camu camu is a fruit with a high genetic diversity, which has a high content of ascorbic acid (vitamin C) whose values are between 2,000 and 2,994 milligrams per 10 gram (mg / g) of fresh pulp. Also in the language of the people Shipibos- Conibo know the Myrciaria dubia; as camo- camo; and uses its mature skin pigment for dyeing plant fibers Chambira (Astrocarium chambira). Camu camu was initially considered a natural source of vitamin C by Ferreyra in 1959 in his monthly report on Agricultural Experiment Station in La Molina. The berries of the camu camu tree have been used by Amazonian Indians(Peru and Brazil for hundreds of years. A highly nutritious food source rich in phytochemicals, it is also easily transportable. Traditional uses, besides food and to promote long life. It is traditionally used in Loreto, Peru. Recent studies categorized as 2,700 mg / 100 g pulp as an average, surpassing fifty times as much as traditionally recognized in orange and lemon. in addition the shell contains abundant natural dye which uses are only just emerging, and require much more research so as to utilize all of this fruit. The camu camu improves the body's immune defenses and helps prevent colds, flu and viral infections. An antioxidant acid called Gallic acid is also present in the camu camu and has antiviral and antifungal properties. The topical Evaluation about the activity of base cream from camu camu (Myrciaria dubia) was performed using a pre-clinical pharmacological study on Holtzman rats, which produced second-degree burns. The average scar reduction in the camu camu group was 69.4 ± 52.85, while the positive control (silver sulfadiazine) was 69.26 ± 53.66. Microscopically Similar leukocyte infiltration was observed in the dermis and the serous layer in the camu-camu and silver sulfadiazine groups, and both were lower than in the control group. In the group treated with the cream based camu camu group observed the presence of epidermis and increased activation of basal cell or a detention oxidative processes due to the antioxidant properties of this fruit. The anti-plasmodial activity of 27 extracts corresponding to 9 plants, from a species of the Peruvian Amazon, were evaluated on Plasmodium falciparum (strain FCR3 resistant to chloroquine) by a direct visual method, the strain was maintained by the method of continuous cultivation and was studied in vitro. The IC50 of aqueous and ethanol extracts of camu camu (Myrciaria dubia) had a value of 3 and 6 mg / mL respectively. Introducing the camu camu activity with two types of extracts, is more likely to submit compounds with anti-plasmodial activity. Vitamin C is an essential collagen nutrient formation, and plays an important role in wound healing. Collagen gives skin its elasticity and its degradation leads to wrinkles, vitamin C also helps to regenerate other antioxidants such as vitamin E, a favorable environmental dietary ingredient for healthy skin. Similarly, the content of beta-carotene camu camu helps protect the skin against sun damage. There are no contraindications by adding camu camu to your diet. Too much vitamin C is not toxic, but prolonged use of large amounts may cause gastrointestinal disturbances or diarrhea. Anyone who has received the advice not to take too much vitamin C should exercise caution such people with kidney stones. For most people, to add a super food camu camu to their diet, is a good idea. The correct taste of this fruit is bitter or sour; the indigenous Amazonian people believe they were utilizing these fruits qualities, for their people. Today, however, it is harvested locally from Amazonian communities and used as a reserve food, but a food of high nutritional value, dried for later or used fresh, it’s used to mix in recipes such as jams, jellies, desserts or drinks. As a home remedy the berries are known to be useful as an antiviral treatment used for a various infections. 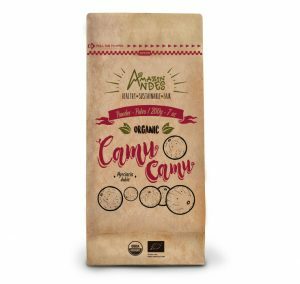 Apart from these local South American regions, the fruit of camu was essentially unknown internationally until 1950 when it was first nutritionally analyzed by the Institute of Nutrition and the Ministry of Public Health of Peru. 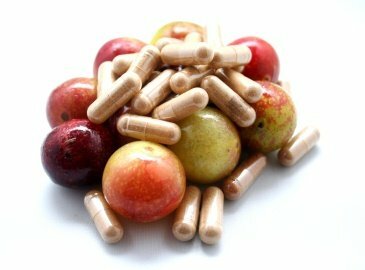 These studies revealed an exceptionally high amount of vitamin C in the Berries, the results documented were, and 2800-3000 milligrams of vitamin C per 100 grams of pulp, from these findings, the camu camu has been rated as one of the highest natural plant-based sources of this important antioxidant. It is recommended to consume an average of ¼ or ½ teaspoon daily of camu camu powder or 3 capsules or tablets x 600 mg per day, these doses provide 80% of the daily dose of vitamin C necessary. Because it tends to have a slightly astringent bitter taste that is often mixed in fruit smoothies, juices and sweet foods or desserts. It is an excellent addition to lemonade, ice cream, kefir and sweet tart citrus flavor, like our recipe lemon bar. 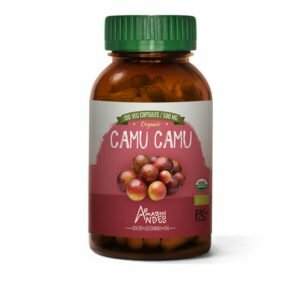 However, camu camu, being considered a nutraceutical, does not require a prescription, and the demonstrated safety of camu camu easy to use. It is Still yet to be developed in clinical studies to better standardize the extraction technique, the preparation of the final product, and the optimum dose to achieve for the desired effect. The camu camu has different presentations according to their different processes, but has proven effective in each use.